KAYAKS AND BODY BOARDS | COMING SOON! 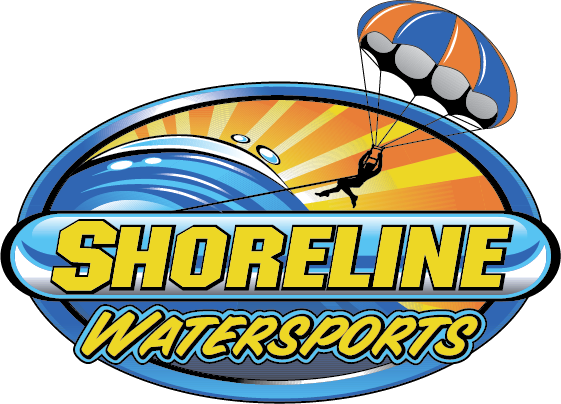 Join us daily at Shoreline Watersports for your parasailing adventure of a lifetime! Ride out deep into the ocean on a banana boat with your family and friends to soar 300 feet above the Grand Strand area, all while witnessing spectacular scenery and sea creatures below. Up to six people can travel out to one of our parasail boats at a time. Single, double or triple flights are available with a 450lb. weight limit per flight (the Captain will make the final call). Each excursion is approximately 30 to 45 minutes, which includes a shuttle ride to and from the parasail boat. Parasail flight times are 10 minutes long! Life jackets and safety tips are provided prior to departure. No prior experience is required! Keep in mind you will get wet! Our friendly office staff will gladly store your valuables safely and securely at the check in counter. Capture your experience by adding on a photo package! Our professional photo staff will take pictures and load them onto an SD memory card for you to take home to share with your family and friends! Up to six people can ride on the banana boat at one time. All riders must be at least 42 inches tall. Weight limits depend on water conditions at the time of your ride. Each adventure is approximately 10-15 minutes long. Life jackets and safety tips are provided prior to departure. No prior experience is required! Enjoy our new 2-mile Jet Ski Course! One of the most popular activities to do while at the beach! Jet ski rentals are available daily for half hour rentals. We have a two-mile jet ski course set up in front of our location. The course is outlined with three yellow buoys. All jet skis must ride on the outside of the course and be at least 50 feet away from other drivers. All riders will receive a full safety briefing prior to getting on the water. A drivers license is required to rent and drive a jet ski. Located in Surfside Beach, South Carolina just south of the Surfside Pier, we offer everything you’ll need to make your vacation one to remember. With highly qualified and trained professionals, we will cater to your every need on the water. All captains have certifications in CPR and first aid, in addition to being US Coast Guard certified. Safety is our number one priority, so rested assure that you will enjoy secure and adventurous beach day with us!